Mice are omnivorous, which means they eat a combination of meats and vegetables. Pet mice should eat a varied and balanced diet that includes fresh vegetables, protein, store-bought mice food, fresh water and treats. 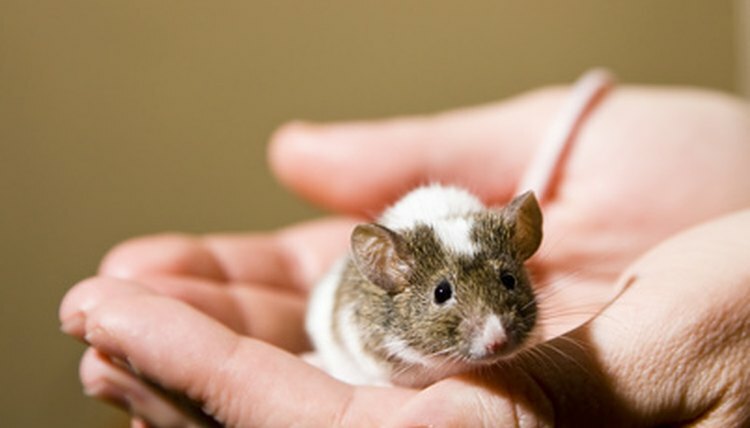 The varied diet will help keep your pet mouse healthy and aid in his development. Store-bought food for mice contains grains, such as barley and millet, which are also rich in fiber. It also contains protein, such as beans and soy, depending on which type of food you find at your local pet food shop. Even if you feed your pet mouse a high quality mouse food, versus a cheaper commercial brand, it is important to also give your little pal fresh fruits and vegetables, particularly crunchy ones. Pet mice will eat most kinds of vegetables, but they tend to enjoy crunchy ones more. Vegetables such as broccoli, carrots and celery contain a balance of vitamins, minerals and carbohydrates that are essential to keeping your pet mouse healthy. A piece of apple also serves as a healthy treat. But crunchy vegetables and fruit also serve another purpose. Rodent teeth never stop growing. Therefore, when your pet mouse chews, it helps keep his teeth from growing too long. Besides crunchy fruits and vegetables, some types of cooked “people” food are safe for your pet mouse to eat. Proteins such as hard-boiled eggs mixed with molasses and bits of stale bread or cooked pasta make for a nice meal and a nicer break from store-bought pellets. Fresh water is essential for your furry pal. Give your pet mouse water in a rodent water bottle, which you can purchase at your local pet supply shop. Keeping the water in such a bottle will keep it clean, since your pet mouse won't be able to get food or waste into it. Change the water regularly, at least four times per week, and rinse out the bottle to make sure it doesn't get slimy. How much food to feed your pet mouse will depend on his size. Larger species can eat 8 grams of food daily, while smaller species can eat a minimum of 4 grams. Discuss the right amount with your pet's veterinarian and then consider splitting it into two meals, one in the morning and the other at night. Some "people" food is toxic to mice. Chocolate, peanuts, acidic fruits, such as oranges and lemons, acidic vegetables, such as onions and garlic, and raw meat may trigger an allergic or otherwise adverse reaction in your pet mouse. Skin irritation and diarrhea are the most common. Pet Mice: What Do Mice Eat? Pet Mice: What Can't Mice Eat? What Animal Eats a Mouse?